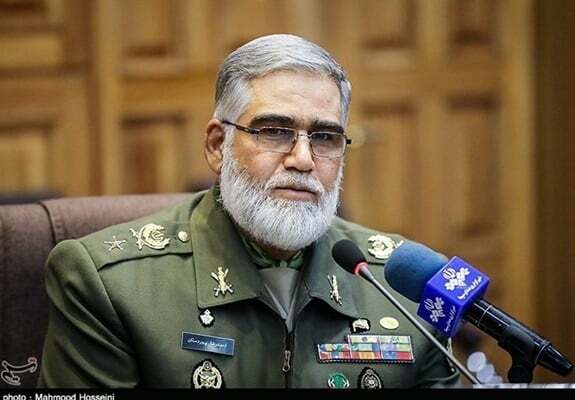 "Iran’s Enemies Have Replaced Suicide Operations with Bioterrorism"
A senior Iranian general says the enemy has replaced suicide attacks with bioterrorism using transgenic products. Brigadier General Ahmadreza Pourdastan, the head of the Army’s Centre for Strategic Research, said the enemy seeks to control the population through transgenic products, and hence, it has replaced suicide attacks with bioterrorism. “The enemy has put on a friend’s garment and says it is ready to have a group photo and have coffee with us,” said the top official. “The victory of the Islamic Revolution [of Iran] in February, 1979 was a political shock to the Americans and confused them and disrupted their equations in the region, he said. “Before the revolution, Iran was one of the important satellites of the Americans, and the country was an open market for American products and all American goods were imported into the country and they took oil instead,” the official added. “However, with the [victory of] the Islamic Revolution, the US was stripped of all these advantages, and it is natural that they are seeking a way to regain the advantages,” he added. “From February 12, 1979 onward, the Americans adopted an approach aimed at toppling [the Iranian government] and sought to uproot the Islamic Republic [of Iran]; so, they imposed economic sanctions,” he noted. The top official said Iran is facing a new form of threats today. “The threat we are facing today is a mixed war,” he said. “The Americans gained experience in World War II and found out they cannot take part in a war of attrition; so they defined a strategy that would help them achieve their objective in the shortest possible time, and hence, they used all cultural, media, economic, political and other levers,” he noted. Elsewhere in his remarks, the top general touched upon the enemy’s war of nerves. “The enemy wants to paint a dark picture of the future through psychological warfare,” he said. “Today, the United States is in the weakest military and economic situation it has ever been, and the UN, Europe, Canada, China, etc are not on board with the US,” he said. “Furthermore, the US is an indebted country and if this trend continues, it will end up having a destiny like that of the former Soviet Union,” he said. The top general then called on officials to fully abide by guidelines of Leader of the Islamic Revolution Ayatollah Seyyed Ali Khamenei. He also urged closer solidarity among Iranians. “We should have unity and rapport like in Holy Defense years (the eight years of the Iraqi imposed war on Iran in the 1980s),” said the top general. Pourdastan then said the Iranian Armed Forces have the enemy’s moves and activities on their intelligence radar and that they will not be caught unawares by any military threat. “If they say our country is a safe country, it is so, indeed,” he said. He then touched upon the recent deadly terrorist attack on a military parade in the southern Iranian city of Ahvaz, and added such “blind terror attacks” which target women and children have no military value.